The Hope Diamond is permanently on display at the Smithsonian Institute’s National Museum of Natural History, Washington, DC. It is the largest blue diamond in the world, weighing 45.52 carats. It formed more than a billion years ago deep within the Earth and was carried by a volcanic eruption to the surface in what is now India. Since the Hope Diamond was found in the early 1600s, it has crossed oceans and continents and passed from kings to commoners. It has been stolen and recovered, sold and resold, cut and recut. Through it all, the diamond’s value increased. 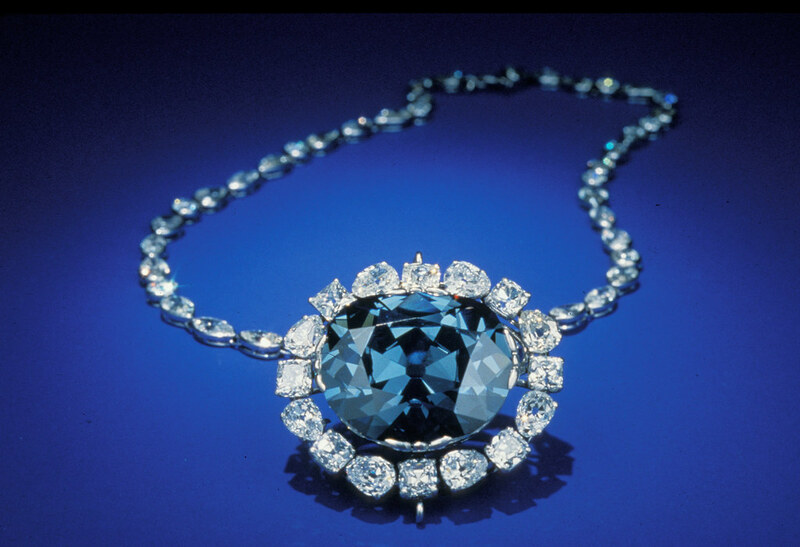 In 1958, Harry Winston donated the Hope Diamond to the Museum, and it now belongs to the people of the United States. Visit the Museum to learn more about the dramatic interactions between people and this diamond, and about its natural history. Posted in Artwork, Photography | tagged art, blue, blue diamond, design, diamonds, gems, geology, geometry, Hope Diamond, jewelry, jewels, light, necklace, necklaces, rocks, Smithsonian, treasures. The permalink.